Seattle, Washington, is the largest city in the Pacific Northwest. 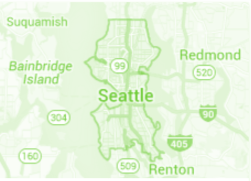 Located between Puget Sound and Lake Washington in King County, of which it is the county seat, and overlooking Elliott Bay, Seattle is nicknamed The Emerald City. The city is a damp green gem, with an abundance of evergreen trees throughout, and spectacular views of the Cascade mountains to the east and the Olympic mountains to the west. The cultural and business center of the Pacific Northwest, the city and its surrounding areas are the home of the Space Needle, Boeing’s aircraft assembly plants, Microsoft, Amazon.com, Costco, Nintendo of America, Starbucks, T-Mobile, and the University of Washington, as well as a vibrant arts and music scene and an excellent park system. Seattle was founded on the rough, physical industries of fishing, logging and coal mining, with San Francisco as her primary customer. Boeing, founded in 1916, grew to be Greater Seattle’s primary industry as natural resources were depleted. The region’s strong economic dependence on Boeing gave the oil recession and cancellation of the SST (Supersonic Transport) in the early ’70s a grim effect. Over the last twenty-five years, the area has become less seedy and more developed with the massive influx of Microsoft money (and other software and biotech proceeds), but Pioneer Square is still the original Skid Row. (Yesler Way was a “Skid Road” for logs skidded downhill using dogfish oil to Henry Yesler’s lumber mill). The listing data relating to real estate for sale on this web site comes in part from the Northwest Multiple Listing Service. Real estate listings held by brokerage firms other than Tribeca NW Real Estate are marked by the "three tree" symbol; detailed information about such listings includes the names of the listing brokers. Data last updated 2019-04-22T19:16:21.087.